Contain North Korean ICBM threats with a sea-based Ballistic Missile Defense, not with THAAD. Unrestrained by international sanctions based on UNSC Resolution 2270, North Korea continues to test intercontinental ballistic missile (ICBMs) and claims to have miniaturized its nuclear warheads. On July 7, 2016 the South Korean government confirmed its intention to deploy the Terminal High-Altitude Area Defense (THAAD) system. Is this Ballistic Missile Defense (BMD) system the best option available? Before long, North Korea will have effective long-range three-stage ballistic missiles armed with nuclear warheads. This is clearly a global security threat, for which a purely national response is inadequate: it requires a regional BMD coalition with multiple layers of collaboration across the Northeast Asia region, encompassing sensors, command and control systems, engagement functions and intercept scenarios. BMD relies on phased-array radar, notably the Aegis system developed by the United States. There are currently six nations operating Aegis-equipped ships, of which three – the U.S., Japan, and the Republic of Korea (ROK) – have recently conducted a trilateral ballistic missile information sharing and defense drill. BMD maritime patrol operations continue, with Australia expected to join in soon. Although its KDX-III Aegis ships offer a sea-based BMD solution, rather than improve this system, South Korea has chosen to develop an indigenous land-based BMD capability, the Korea Air and Missile Defense (KAMD) system. Then suddenly, apparently in response to several missile tests this year, South Korean President Park Geun-hye agreed to deploy THAAD on South Korean soil. This places the defensive weapons system closer to North Korea, but also closer to China. According to the ROK defense minister, Han Min-Koo, THAAD will enhance the KAMD system (which comprises PAC-3 medium- and long-range missiles to be deployed in 2020 and 2022) but without joining the U.S.-led BMD partnership. Details of the THAAD deployment are yet to be determined, but seem likely to resemble the configuration of the THAAD systems in the Middle East. In my view, THAAD is not the only choice for South Korea, for three main reasons. The first issue is cost. North Korea has had short-range ballistic missiles since 1998, but is now developing and testing various types of ICBM, so clearly South Korea requires a more comprehensive and well-integrated BMD system. But it seems impossible for South Korea to afford all the desirable capabilities, so the best approach is an incremental spend-and-build policy. The greatest challenge which KAMD must address, given the geography of the Korean peninsula, is the interception of North Korean missiles during their terminal flight phase, at high speed and in a brief time window. The threat from North Korea’s long-range artillery is localized to the vicinity of the DMZ, but dealing with their multistage ballistic missiles requires the creation of a complex and distributed infrastructure. Currently, KAMD is attempting to develop a THAAD-like capacity, an unnecessary and costly redundancy, since only a low-depth BMD capacity is required. Using THAAD to intercept ICBMs will necessitate interoperability between the U.S.-led BMD and KAMD: sensors must agree, and Command and Control Battle Management systems must be fully interlinked between the two nations, AN/TRY-2 radars need to be reconfigured, and other systems established for networked integration of engagement coordination. The UAE has already experienced similar issues with its THAAD, which has proved very costly. In contrast, the first batch of KDX-III destroyers, deployed since 2010, have already demonstrated a Sea-Based Terminal capability around the Korean Peninsula, and it would be quite straightforward for South Korea to incorporate BMD sensors in their radar systems. Currently the ROK navy has level 8 Aegis capabilities, but this could be updated to level 9 for the second KDX-III batch, which will also have a superior intercept capability using SM-3 missiles. This program will therefore be able to contribute cost-effectively to monitoring North Korean ballistic missile threats from the seas around the Korean Peninsula, providing space tracking and surveillance systems, forward-based midcourse X-band radar, early warning radar, etc. The second issue is functionality. The plan to establish land-based KAMD is dangerously unproven; indeed THAAD has only just begun the process of deployment in the United States and in the Middle East. THAAD is technically extremely challenging, being intended to intercept both endo- and exoatmospheric ICBM threats in various phases of flight. 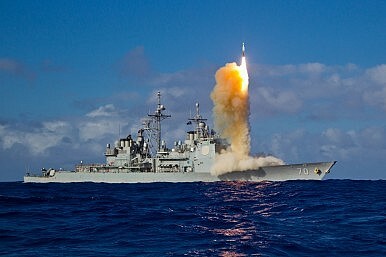 In comparison, sea-based Aegis BMD programs, with targeting sufficiently effective to identify warheads and decoys in real time, began in 1969, just before the U.S. signed the Anti-Ballistic Missile (ABM) Treaty in 1972. THAAD’s targeting the terminal descent segment of ICBM trajectories is particularly difficult, especially between 30 km and 45 km, whereas SM-3s have been shown effective in the 150-600 km range, using improved radar tracking with better resolution. Thus, on September 18, 2015, the United States conducted a fourth consecutive successful intercept test of the SM-3 Block IB exoatmospheric interceptor with the Aegis BMD 4.0 Weapon System. Instead of depending on untested THAAD-like KAMD systems, South Korea should expand its BMD patrol missions using sea-based Aegis capabilities to cover the ascent, midcourse, and descent phases of long-range and multistage ballistic missiles. The third issue concerns experience. Joint BMD management and coordination in a BMD coalition offers an invaluable learning opportunity. South Korea has much to gain from U.S. experience: over 50 years of Aegis BMD and over 60 years of interception experience and real-world performance. The U.S. Navy has been conducting regional BMD patrols since 2004, and the Aegis BMD systems deployed today in Asia and Europe have proved robustly reliable in sea-based BMD tests, but without the requirement for acquisition sensors. The ROK and U.S. militaries have been practicing high-intensity air defense with surface-to-air missiles at sea, at progressively longer ranges and with ever greater interoperability – including tracking North Korean long-range missile tests on three occasions in both the East and West Seas. As part of this interoperability, the ROK Navy has pioneered the implementation of sea-based BMD capability using high-speed data links to exchange missile interception data among various sensors. Ideally, the BMD coalition must be a global effort, integrating BMD systems and weapons worldwide. The secretive nuclear and ballistic missile programs of North Korea endanger the entire region, and even ultimately China, so this threat requires as many nations as possible to cooperate in a sea-based BMD enterprise. The ROK Navy should seek to establish reliable maritime BMD partnerships with allies and like-minded nations who are equipped with Aegis BMD capability, including SM-3s: only a coalition like this can be cost-effective, fully functional, and experienced enough to build a reliable shield against North Korean aggression. Captain Sukjoon Yoon (ROK Navy Ret.) is Senior Research Fellow at the Korea Institute for Maritime Strategy, and Director of the International Maritime Security Program.